Mr. Firley is one of the sweetest, friendliest gentlemen you'll ever meet. He's from the Annandale Love Tribe* so of course, sweet is in his genes. Firl was about a year old when he first came to CR!FR. He was shy but he let it be known he wasn't feral like those other guys. Within a few days he was curling up on laps purring heartily. Firley loves attention & cuddles. His loud high-piched meow lets you know when he wants some. He'll sit on your lap for as long as you'll let him, purring & smiling. He's very well-behaved & dignified, although he does like to play & gets pretty frisky when wiggly strings are involved. 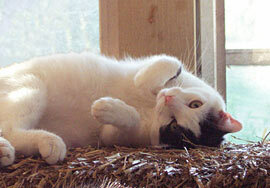 Firley would love to have a place of his own where he wouldn't have to compete with as many other cats for attention. He'd like to share his new home with Maybach, an other ultra-sweet member of the Annandale colony & possibly his brother. Together, they're a Love Tribe of their own.